Department of Computer Science & Engineering,SET is organizing the “Faculty Development Programe/T3” on Introduction to Business Analytics on February 15, 2019 – February 17,2019. @ Sharda University,Block 1. Department of Computer Science & Engineering, SET is organizing the “Faculty Development Programe/T3” on Introduction to Business Analytics on February 15, 2019 – February 17, 2019. Faculty Development Programme (FDP) aims at equipping teachers with skills and knowledge that are essential for inculcating entrepreneurial values in students and guiding and monitoring their progress towards Entrepreneurial career. To offer Learning on basics, emerging trends & challenges in the field of Business Analytics. To improve faculty’s ability in carrying out research & testing. SOE school of education creates teachers with a mission to provide quality teaching we equip them with the theory and practical knowledge based on current trends and global needs. In order to help students explore placement opportunities SOE is organizing Placement Drive for campus recruitment of the students who are in the final year of B.Ed. and for B.A. B.Ed. & B.Sc. B.Ed.III year. on 18 and 19 February 2019. To assist students in proper placement. To provide schools the best of the talent. To give exposure and hands-on experience to the students to students to appear in an Interview particularly for B.A.B.Ed. and B.Sc. B.Ed III year students. The Department of Life Sciences, School of Basic Sciences & Research (SBSR) is organizing an Educational visit to ICAR-NDRI, Karnal for its M.Sc Biotechnology final year (Spring Batch), M.Sc Food Sciences & Technology final year students and for M.Tech Animal Biotechnology/ Integrated Biotechnology/ Genetic Engineering First Year students from School of Engineering & Technology on 18th February 2019. The National Dairy Research Institute (NDRI), Karnal is a premier and prestigious institute for dairy research in India. It was established at Bangalore in 1923 as Imperial Institute of Animal Husbandry and Dairying. In 1936 it was renamed as Imperial Dairy Institute. After the independence of India, in 1947 it was renamed to its current name. In 1955 the institute’s headquarters moved to Karnal. The status of deemed to be university was conferred to the institute in 1989. To aware the students with current research standards in different areas of Dairy Technologies and Animal Biotechnology being adopted/ developed in India. School of Creative Art, Design and Media Studies, Department of Design is conducting 5 days weaving workshop conducted by the Ministry of Textiles for 2nd and 3rd-year fashion design students on Monday, February 18-22, 2019. Ministry of textiles will also provide Sharda University a certificate as an indication of our participation. The workshop aims to expose students with the Indian Artisans skill and enrich them with the ability to design and make their own fabrics. The students will need to be ready with their theme & color boards before the workshop. 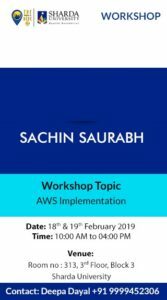 Department of Computer Science and Engineering (SET) is organizing Two Days Hands-On/Workshop on “Web Development in AWS” on 18th and 19th Feb 2019. 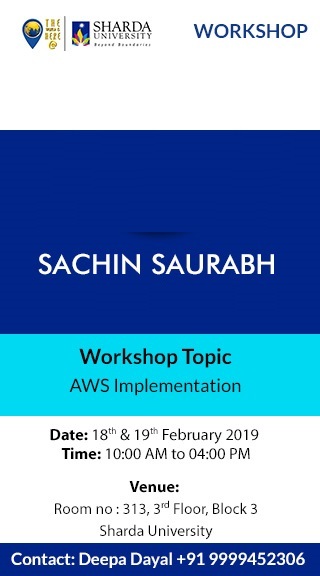 This is a complete hands-on workshop on Web and application development with AWS. In this workshop, we will work on AWS EC2, Code Igniter, and RDS in AWS. Mr. Sachin is AWS Certified Professional with rich experience in the effective management of IT Infrastructure Project for new facilities, Microsoft Technologies, VMware Virtualization, and AWS Technology. Department of Civil Engineering is organizing a Field Visit to Block 4 Construction Site for their B.Tech 2nd Year Students on 18th, 19th, 20th, and 22nd February 2019. Learn about the reinforcement detailing of structures. Identify types of formwork used. Learn about the Construction practices. School of Architecture and Planning (SAP) is taking Third Year students to ISKCON Temple to do a live case study for their design studio exercise. Students of B.Arch 3rd Year are taking ‘Braj Cultural Resource Centre at Govardhan’ as their Design Project. The visit to the ISKCON is a case study to understand the essence of Braj culture. The visit aims to give students exposure to the planning concepts, zoning, circulation, the interrelation of spaces, architectural elements etc. The students will document their experience of the place which will be presented in the design studio. The students will learn to observe the resource center architecturally, socially and culturally. They will able to identify and critically evaluate the culture of Braj which is very well imbibed in the center. This will help in conceptualizing the design solution. Prof. Rupinder Singh, 8527925100, rupinder.singh@sharda.ac.in. Department of Computer Science and Engineering, SET is organizing Cisco Networking Industrial visits at Network Bulls for B.Tech Students on 19th and 21st February 2019. This visit will help students to know about Career options and growing scope in the networking field. Students can practice on real live devices & get experience. School of Architecture and Planning is taking the students of Third Year to Sharda Hospital, Greater Noida, to do a live case study for their design studio exercise in subject ARJ-311. Venue: Sharda hospital & health city, Knowledge Park III, Plot#32& 34, Greater Noida. School of Law, Sharda University is organizing a Criminal Law Quiz on Tuesday, 19.02.2019. @ 502, Seminar Hall, 5th Floor, School of Law. School of Law, Sharda University is organizing a Criminal Law Quiz on Tuesday, 19.02.2019. This Quiz will focus on Indian Penal Code and Criminal Procedure Code. Students will be able to understand and apply various provisions of the Indian Penal Code and Criminal Procedure Code. Venue: 502, Seminar Hall, 5th Floor, School of Law. To record baseline data regarding the Oral Health Status of the School children from grade 5th – 12th using the WHO 2013 proforma and educating the students about the deleterious effects of tobacco and oral health education and hygiene awareness session. 1) Screening for oral diseases among the schoolchildren using the WHO 2013 proforma. 2) Educating about the deleterious effects of tobacco consumption. 3) Promoting general and oral cleanliness among schoolchildren. 4) Promoting Healthy eating habits among school children (diet counseling). 5) Distribution of Oral Hygiene Kits. School of Engineering and Technology is organizing One Day Workshop on “Intellectual Property Rights – Complete Process” on 20th Feb 2019. The workshop will focus on the importance of Intellectual property rights. Procedure to file a patent. How to do focused research for patent filing. School of Law, Sharda University is organizing Faculty & Students visit to District & Session Court, Gautam Budh Nagar on Wednesday, 20th February, 2019. 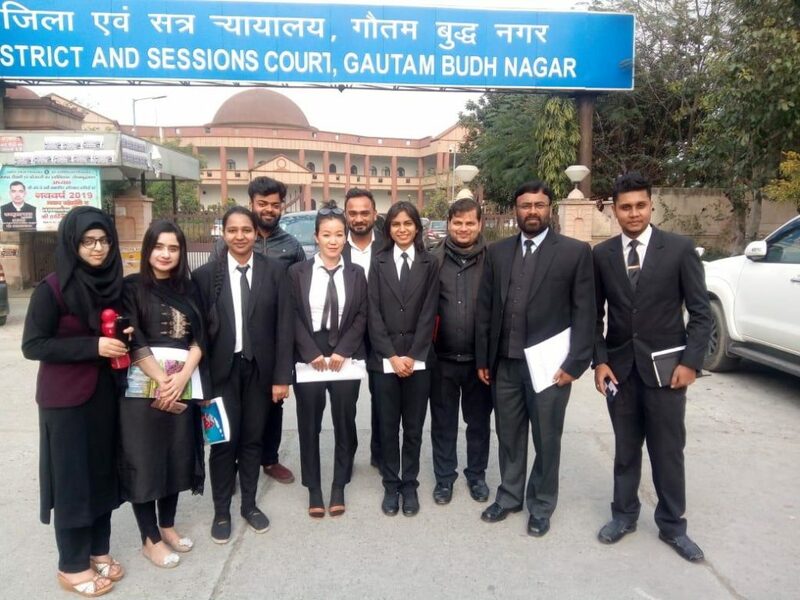 As part of the Community Connect Programme, School of Law, Sharda University is organizing Faculty & Students visit to District & Session Court, Gautam Budh Nagar on Wednesday, 20th February 2019. The primary objective of this visit is to facilitate student’s interaction with Lawyers, litigants and accused. Students shall prepare a questionnaire for the project report on plea bargaining and delay in Justice. The students will learn court craft & etiquette. Date: Wednesday, 20th February 2019. 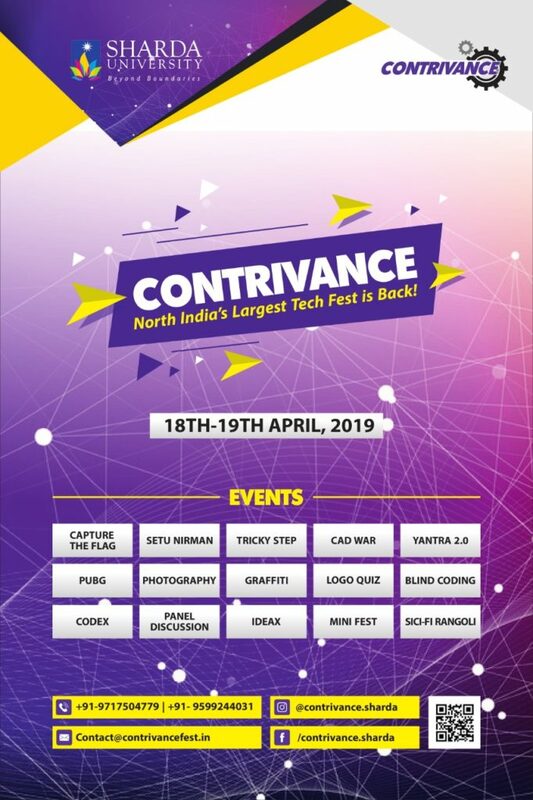 Venue: District & Sessions Court, Surajpur, Gautam Budh Nagar, Greater Noida.